About the Awards — Triple Crown & Grand Slam of National High Adventure — Charles L. Sommers Alumni Association, Inc. The Boy Scouts of America’s National High Adventure Bases are: Northern Tier High Adventure Bases (Northern Tier), Philmont Scout Ranch (Philmont), Florida National High Adventure Sea Base (Florida Sea Base), and Paul R. Christen National High Adventure Base at The Summit (Paul R. Christen). In April 1996, Sam Wampler, then the Director of the Florida Sea Base, awarded the first five Triple Crown of National High Adventure awards to members of Explorer Post 525, from Edgewood, Washington. The Triple Crown of National High Adventure has gained significant stature over the years, making it one of the most highly sought program awards. It gained additional notoriety when Joseph Csatari portrayed the Triple Crown of National High Adventure on the Eagle Scout’s uniform in his “100 Years of Eagle Scouts” painting released in 2012. The Charles L. Sommers Alumni Association, Inc. in conjunction with the Boy Scouts of America have authorized the issuance of a special patch to honor those who have participated in at least one qualifying high adventure program at three of the BSA’s four National High Adventure Bases. Recipients of the award receive one Triple Crown (3-inch) award patch reflecting the three National High Adventure Bases where they participated in a high adventure program. 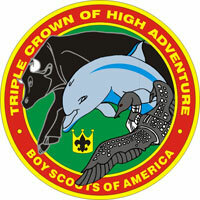 An optional large (6-inch) Triple Crown of National High Adventure award patch is available for purchase. There is no limit on the variations and quantities that may be ordered of the large patch. The Charles L. Sommers Alumni Association, Inc. in conjunction with the Boy Scouts of America have authorized the issuance of a special patch to honor those who have participated in at least one qualifying high adventure program at all four of the BSA’s National High Adventure Bases. Recipients of the award receive one Grand Slam (3.5-inch) award patch. Both the Grand Slam of National High Adventure Award and Triple Crown of National High Adventure optional large (6-inch) patches are available for purchase. There is no limit on the variations and quantities that may be ordered of the large patch.